Nature! Thailand has no shortage of gorgeous natural areas to explore, and Khao Yai was right up there as one of our favourites. 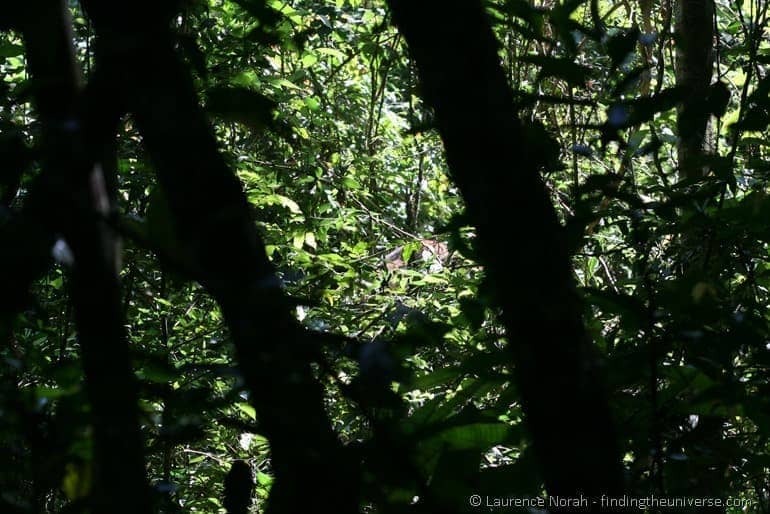 It was the only place in Thailand where we saw elephants in their natural habitat, as well as countless other species of animals, from deer to gibbons. In today’s post I’m going to tell you all about what we got up to in Khao Yai. First though, some where and what. 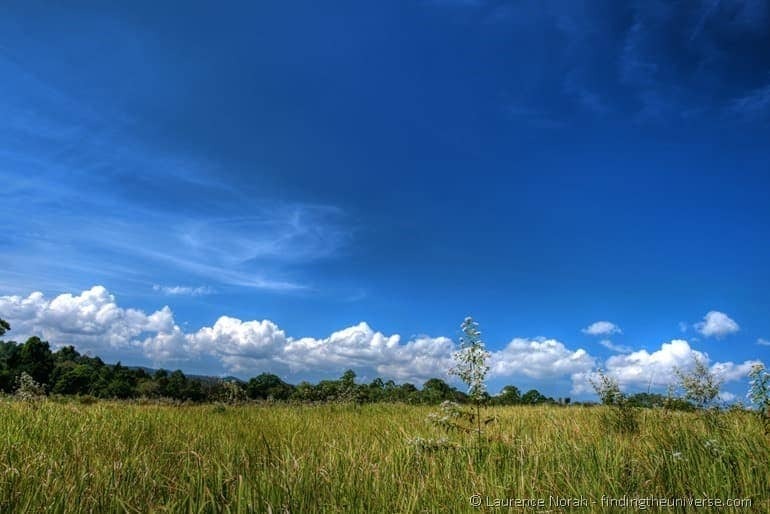 Where and what is Khao Yai National Park? 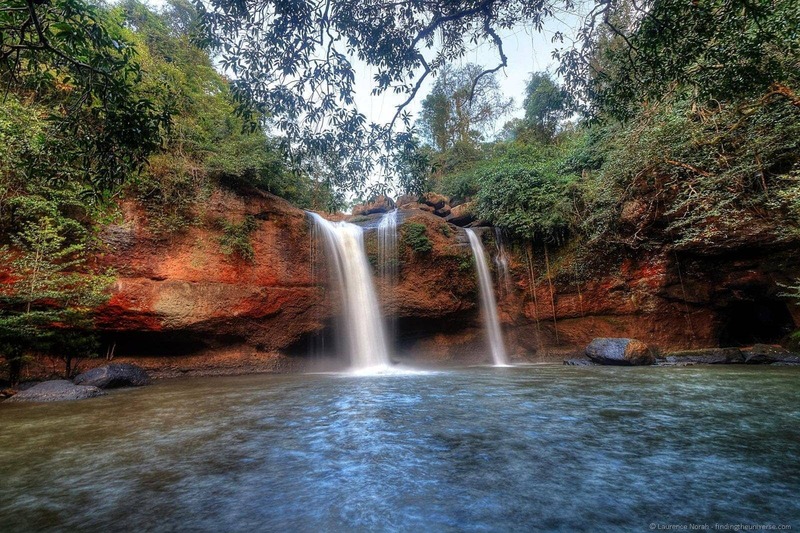 Khao Yai National Park was the first national park to be established in Thailand. It’s to the east of Bangkok, not too far away from the regional city of Nakhon Ratchasima (also known as Korat). These days it is the second largest national park in Thailand, and along with a number of other surrounding natural areas, is a UNESCO listed world heritage site. The park is fairly mountainous, with winding, monkey strewn access roads which offer gorgeous glimpses of lushly forested slopes. It has a visitor centre and there’s a lot to see and do, from wildlife walks to waterfall hunting. We spent a couple of days in the park, and this was what we got up to. Khao Yai National Park is one of the best places in Thailand to see Asian elephants in the wild. There are two good ways to do this, the first being by night safari (see below), and the second by guided walk. Our first adventure in Khao Yai was therefore a guided walk, which involved us meeting up with a ranger, being issued with leech socks (we hadn’t by this point had the joy of the leech infested Khao Sok to know what these were for), and then setting off with our guide. This was pretty handy – as with other national parks where we did a similar walk the guide knew all kinds of stuff about the local flora and fauna, including medicinal uses, and kept us entertained as we went. 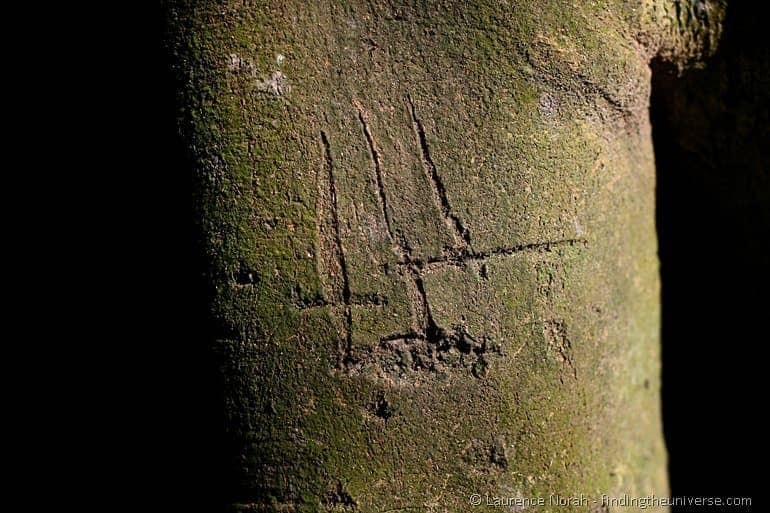 We saw ancient bear scratching posts, giant insects, and all kind of fascinating trees. The piece de resistance though came when the guide suddenly motioned us to stop, and we were able to hear large crunching noises in the undergrowth. Looking faintly concerned, our guide explained that there were elephants in the undergrowth, and we had to be careful, as they had a baby with them. Now, I’m not going to lie, our view of the elephants wasn’t exactly mind blowing. There were hints of brown and grey through the foliage, with the occasional whisk of a tail and the waving of a trunk. The photos largely reflect this. But still. We did see elephants in the wild in Khao Yai, and that left us on a high for the rest of the day! Even if we hadn’t seen elephants though, the walk would have been worth it. Starting off in jungle, and finishing on a huge grassy plain by a waterhole, it felt more like Africa than Thailand. And at only 3km it was easy enough for folk of any fitness. Note – the guide fee was 200 Baht for the two of us, and remains the same regardless of group size. A guide is very much recommended as the path isn’t always clear and you don’t want to get lost in Thailand’s second largest national park! They can be arranged at the national park office in the centre of the park. Just outside the national park itself, there is a large limestone cave which is home to around a million bats. These chaps are asleep all day, but as the sun sets, they launch themselves into the sky in an effort to catch themselves a bit of food. The spectacle that results is quite unlike anything I’ve ever seen. 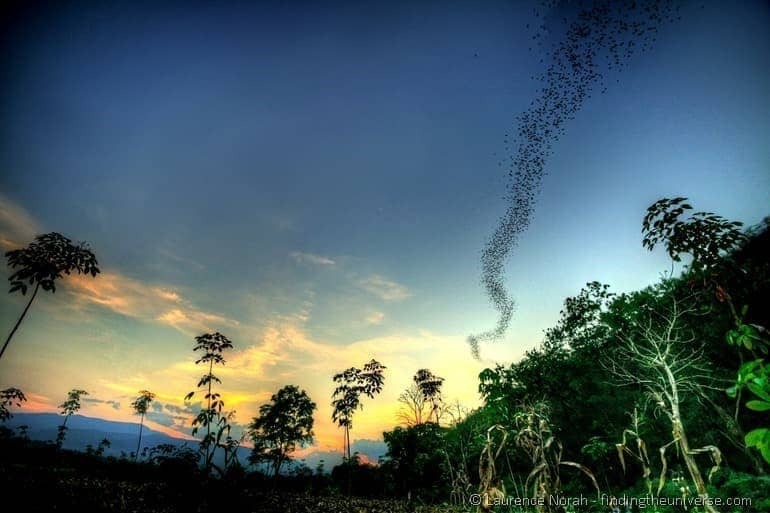 Thousand upon thousands of bats stream out of the cave entrances on the hill in a giant bat ribbon that flows undulating across the sky. Hawks circle, looking for an easy meal, with the bats surviving through sheer weight of numbers. Throw in a gorgeous sunset and it’s a sight you are never going to forget. One of the problems with trying to see animals in any national park is that a great number of them are a lot more active in the cool of the night than the heat of the day. 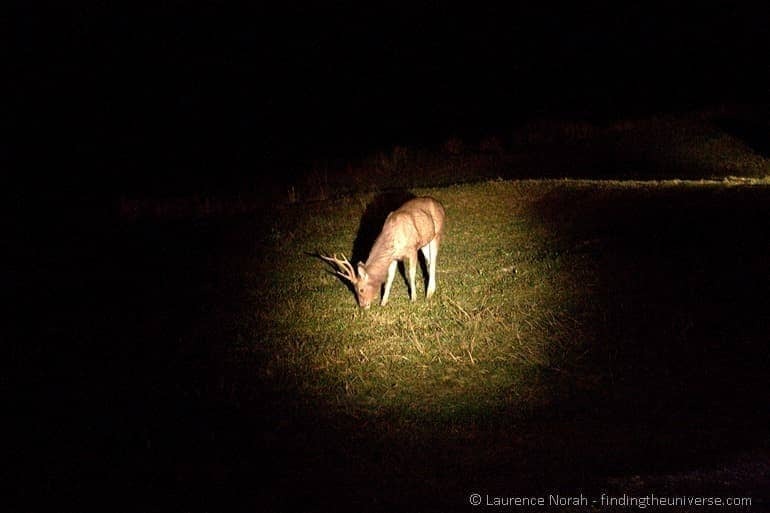 It is for this reason that a night safari is an excellent way to see a whole range of animals that would be fast asleep and well hidden during the day. In Khao Yai nightly safaris take the form of some open topped pick up trucks with a couple of rangers in each – one driving and one operating a very bright spotlight with which to see the various animals. It does seem a bit weird to be driving around in the darkness in a line of pickup trucks shining lights on animals, but I have to admit that it is a great way to see animals, none of which seemed particularly perturbed by our actions. As the full moon rose above our convoy we were thrilled to see all kinds of animals, from massive deer through to porcupines and of course, lots and lots of monkeys. Definitely worth doing. If you want to do a night safari you just need to arrange it from the national park office, and when we were there the fee was 200 Baht for the vehicle and driver, which could accommodate about eight people. I do enjoy a nice waterfall, and Khao Yai has no shortage on offer. We were particularly impressed by Haeow Narok, which splashes down 150m of rock face, and earns the title of largest waterfall in Khao Yai. The walk down to the viewing platform is fairly steep, but it is very much worth it for the view. 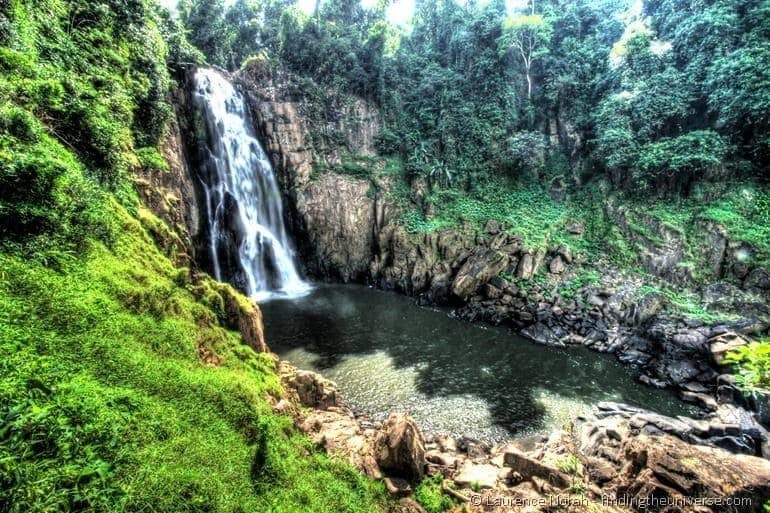 There are of course other waterfalls in the park, and if you are lucky, on one of the walks you may come across the parks lonely resident Siamese Crocodiles. How they got into the park remains a mystery, with the popular opinion being that they were released here by someone who didn’t want crocodiles any more. At up to three metres long, they are an impressive sight for sure. 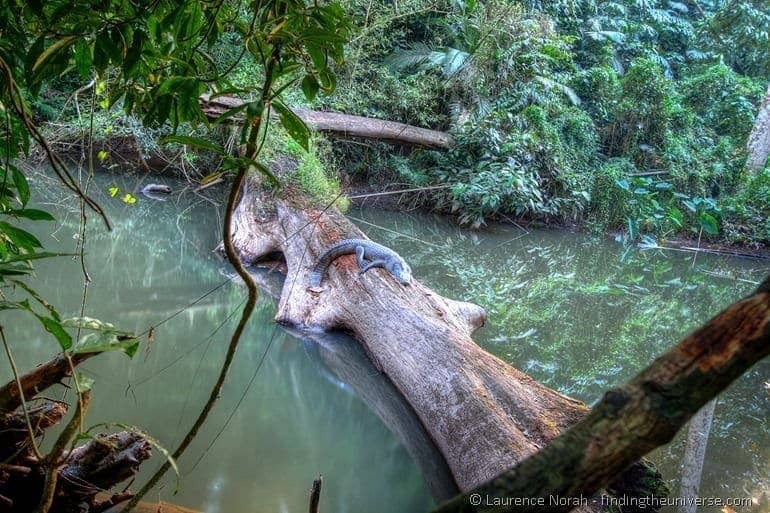 We spotted one basking in the sun on a log as we walked to Haeo Suwat waterfall – another impressive sight that tumbles into a large plunge pool deep in the forest. Although there is handily a campground just up the road, which was stuffed to the gills when we popped by. Entry to Khao Yai was 400 Baht per person for a foreigner when we visited in early 2013. These fees apply for each day that you visit, although if you leave the park and re-enter on the same day you don’t get charged twice. There was no public transport to get around Khao Yai that we could see, so sorting out your own transport – be that a car with driver or a scooter – is going to be the way to go. We had a vehicle with driver. Another option is to arrange a tour with a local operator, or through the park office, and this will come with transport. Khao Yai is found on the main road between Bangkok and Nakhon Ratchasima (also known as Korat). Our route had us arriving in Korat, and then picking up local transport here, however most buses or trains stop in Pak Chong before they get to Korat, and this is the closest main town to the park. From here you can arrange transport in the form of a songthaew (local pickups that serve as taxis) to the park area. You can stay in the park under either canvas or in cabins, both of which can be booked via the park office. Baan Saranya Khaoyai – features bungalows with air-conditioning, hot showers, and WiFi. Lala Mukha Tented Resort – If you prefer your tent to come with a real bed and flat screen TV, this glamping experience is a great option. There are loads more options in Mu Si, check them all out on booking.com here. The majority of tours that we have found to Khao Yai operate from Bangkok, and we list these below. However, if you want to stay locally in the area, we suggest chatting with your hotel reception staff, as they will nearly always be able to assist you with booking a tour locally as well. A full day trekking trip through Khao Yai, with departure from Bangkok. Includes entry fees, water, and a full lunch, as well as raincoats and leech socks. A Tour of Khao Yai that also includes a visit to a local market and a Thai cooking class. We’ve written a great deal about Thailand to help you plan your trip here. Here are some of the most useful posts for your research. Our tips for what to do in Kanchanaburi – there’s a lot more here than the Death Railway! And that’s it! We hope you found this post useful, as always, do let us know your comments and feedback below. Hi, which one you enjoyed more – Khao Sok or Khao Yai? You say it’s the second largest then you say it’s the largest national park. 400 baht is not per day, it’s per visit. Stay 5 nights you still pay just 400 baht. Why do you keep spelling it khao yoi? Thanks for your feedback, much appreciated 🙂 I have updated the post per your comments. My only query is around the 400baht per day – my understanding is that it’s 400 baht for one day (so you don’t have to pay if you leave and re-enter on the same day). It’s also 400 baht if you stay in the park for a few days. However, if you leave and come back another day, it’s another 400 baht. Is that correct? Hi, please, please, please can you help with how to plan this trip, We have been to Thailand and loved the off the beaten track places, real Thailand, real wildlife and your little trip here in Khao Yai seems the perfect thing for us. Hey Tony! Thanks for getting in touch. 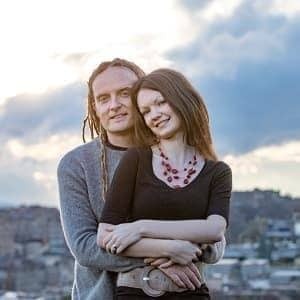 I have updated the post with some content that should help you a bit with your planning based on your questions. My advice is to get somewhere local like one of the hotels I recommend, and then arrange transport or a tour from there, which will likely be the easiest way to go.